Borne in on a breeze of magic, mystery and (of course) chocolate, Joanne Harris ends a seven-year break from her Chocolat series as new eddies stir the sleepy village of Lansquenet-sous-Tannes as Viannne Rocher returns. As new rivalries emerge, conflict threatens to erupt into violence, and even murder in a novel that’s both a treat for fans and an ideal doorway for new readers. This edition includes an exclusive afterword about revisiting Chocolat, and a short story, The Cat Child. Following two relatively niche novels, Joanne Harris achieved worldwide acclaim with her self-proclaimed ‘funny little book’ Chocolat, a delicious tale of belonging and temptation of which the Literary Review famously asked, ‘is this the best book ever written?’ Further tales in the Chocolat universe followed, but Harris has wasted no time in spreading her very capable wings into other genres, including the YA universe of the Rune series and even a Doctor Who novella. Her Malbry series – based around the exploits at St Oswald’s Grammar school in the fictional town of Malbry – plays perfectly to Harris’s strengths, combining deft characterisation with a typically nuanced, multi-layered narrative. 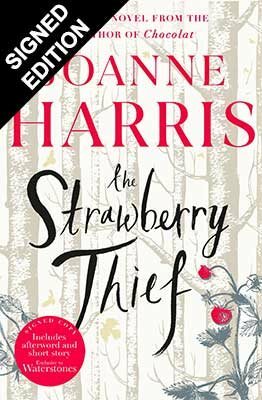 The latest in the Chocolat sequence, The Strawberry Thief, was published in 2019. Welcome back to Lansquenet-sous-Tannes and Vianne Rocher’s chocolate shop. Years have gone by since she opened her chocolatier, her daughters are grown up and Reynauld, the priest became a dearest friend. I've never read Chocolat - or its two sequels - but found this worked perfectly well as a standalone novel.